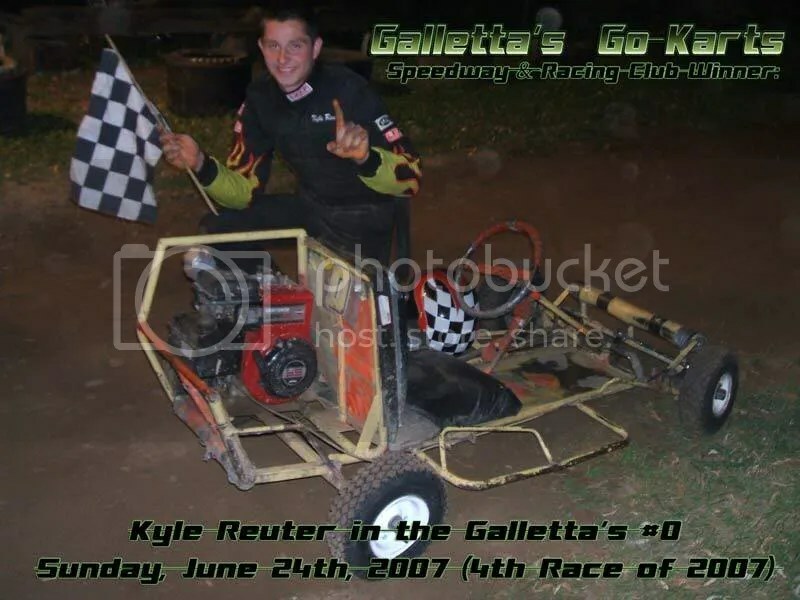 2007 - "6/21/2007 – Galletta’s Go-Karts Exhibition at Oswego Speedway’s Mixed-motor/Open Yard Kart Class won by Matt Stevens! +YouTube"
At Oswego Speedway‘s Dirt Track on Thursday, a handful of members from the Galletta’s Karting Club invested in some slicks and gave the track a spin. As noted on our forums, track operator Jim Losurdo talked a few of our club members to come back assuring us that there would be no more problems like we had last year with the now 6.5hp “Outlaws” (fights, cheating with motors that go way beyond stock, so on), but one condition is that we needed to have slicks on our drive-tire (for us, our left rear tire and preferably our left front as well, as the right side tires do not dig as much). Inverting last week’s order of finish and drawing for position, the we ran a heat and a 30-lap Feature. Eric Raponi took his first row starting position and won (in his OHV 6.5hp #83), followed by Matt Stevens who came from dead last (in the Galletta’s #33 with a stock 5hp Briggs) and Kyle Reuter (Galletta’s 5hp #0) who started 3rd, wrecked, and came back from the rear. Mark Miller (who won the heat with his #00 with a Briggs 6.5hp OHV) finished fourth on the track, but in reviewing the tape we observed that during a caution he restarted himself 2 positions higher than he was supposed to – something he used to do at Galletta’s in 2005 as well, the all-time leader in passes under caution! lol! – so he was DQed to last in the points scoring. That moved up Gary Miller (stock 5hp #24), Joe Hayden (OHV 6.5hp #5), Chris Stevens (in the Galletta’s #8 with a 5hp Briggs), and Wesley Stevens (in the Galletta’s #4 with a 5hp Briggs) one spot each and Mark should start in last in the next feature that he enters. Galletta’s Go-Karts at Oswego Speedway’s kart track racing with OHV Yard Karts on 6/21/2007! Click here for a couple of video clips from this race. Also, I’ve devised a points formula for the Oswego Yard Kart races. The points formula is the exact same as the Galletta’s formula (seen in the rules section) except we will not count laps led like we do at Galletta’s. We count any Oswego event when (1) our Galletta’s team goes and (2) we have a camera man to review the tape and make accurate placement. Prior races in 2006 were counted generically retroactively, with each entered driver scoring the same and the winner getting extra points (the only way to do it since we had no video in 2006 that we have in our possession – although Team Seabrook is said to have some tape, they apparently don’t like us and never brought it to us). Here they are after 2 races. The next Galletta’s Points race is set for Sunday, July 1st, 2007. Qualifying events (Rookie/Novice Qualifier Race and/or Veteran Heats) will begin at 6:30pm, and the Feature will begin shortly after 7pm (two Galletta’s regulars cannot arrive before then). You MUST reserve your spot in the racing festivities via arrival or phone call by 6:30pm, or else we WILL start without you. We’ve wasted too much time in the past waiting for people who said they may be coming and then don’t show without even a courtesy call and we won’t tolerate such rudeness anymore (especially when these same people whine about getting out late and then arrive late or never). Bring your own stock 5hp kart or rent one of our Galletta’s backup/rentals. As for further updates, new rules (designed to speed-up the racing action while adding more safety) and communication with us and other Galletta’s Karting Race Club drivers, please join our brand new Galletta’s Go-Karts Message Board! Kyle Reuter wins his first feature of the year in the Galletta’s #0 after he accomplished a rare feat: He passed Matt Stevens in his Galletta’s #33 for the lead! A loose track enabled many back and forth passes within the 12-kart event that concluded with a tremendously exciting finish. Contains the June 21st, 2007 races at Oswego Speedway and the June 24th, 2007 races at Galletta’s. (Left) The first heat was won by Kyle followed by Missy Berry and Chris Stevens. (Right) The second heat was stolen from Kelly Miller by Matt Stevens and others on the last lap when Kelly’s motor started pouring smoke and lost power. Reuter found this hysterical! In the feature, an opening lap pileup (click here for a video clip from the DVD) and several cautions by a couple of inexperienced drivers slowed the action considerably. And the track was very loose, which led to many passes during the event. Kyle passed Matt about mid-way when Matt’s #33 hit some loose patches, as the same loose patches that enabled Matt to pass everybody now worked against him. Kyle found a low groove and was able to hold off challenges by Matt, Chris Stevens (in his backup Galletta’s #5 for the evening), and Oscar Berry, who drove his Flyin’ Ozz #11 to perhaps his career best race. Late in the race, Matt’s #33 blew a tire and he hopped into his old trusty Galletta’s #3. (Left) Matt worked his way up the field and did challenge Kyle late, but spun out on the last lap settling for 5th. (Right) Kyle was followed past the checker by Chris Stevens and Oscar Berry (in the Flyin’ Ozz #11) drove great all night and scored third. Kyle is another example of a great driver winning in Galletta’s house karts, proving all those whiners wrong when they claim that we rig the races by making our backups slower. Must be that they just aren’t great drivers, then! Ha! Great job, Kyle! I think we’ll have to call Kyle “The Face“, a pro-wrestling term for a good guy that everybody cheers for. I guess that makes Matt and myself heels because everyone cheers against us other than my wife, Matt’s girlfriend, and our mom, Haha! Anyway, more discussion on this message board thread. Points system is in Rules section. Each race awards points on a scale dependant with the amount of laps ran. In addition, Feature Laps led (and top 3 positions in fact) award points. ^ = timeouts. A timeout is a break in the action for a repair that takes more than a few minutes or if you bring out more than 3 cautions in one race. You are only allowed 4 all year. Starting on 6/24/2007, If you bring out more than 3 cautions and continue to race, you are docked 10-points as well as a timeout. Also, mid-race kart-switches are now 10-point deductions. You must race the same kart you started and not spin out/cause wreck more than 3 times to avoid the deduction.